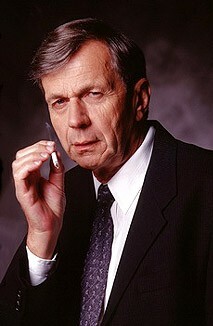 Dark, enigmatic and ever-smoking, The Cigarette-Smoking Man, also referred to as The Cancer Man, appears to have a hand in the highest realms of the United States government as well as in those around the world. He is the US head of the Consortium, lead by the Well-Manicured Man, and was once a close friend of Agent Mulder's father as well as a closer friend of his mother. Mysterious to the last, Cancer Man has been involved in the most highly guarded US secrets from the assassinations of John F. Kennedy and Dr. Martin Luther King, Jr. to the demise of an extraterrestrial being, hijacked from its own craft. His extreme influence throughout the government made Mulder and Scully's investigations of keen importance to both he and the consortium. Seeing as their work could potentially leak vital information about plans for extraterrestrial colonization, he made great efforts in thwarting their investigations at every turn, by feeding them false allies, such as Alex Krycek, and even gaining influence over their actual ones like AD Skinner. The audience never has a chance to learn his real name; the pseudonym he uses forhimself is Raul Bloodworth, and Lee Harvey Oswald calls him "Mr. Hunt". He has access to the basement of the Pentagon, and when he's not obfuscating the Truth, he's rewriting it,though at one point he was "cut out of the loop" of the Consortium. Seeing that his influence with the group, in regards to Mulder, was dwindling, he notes to the consortium that he had needed expertise. However, no one was convinced and he was shot by an assassin called Quiet Willy. He survived and was later "welcomed" back to the group, only to be betrayed by those whose strings he had once pulled and were once his allies; Alex Krycek and Marita Covarrubias.